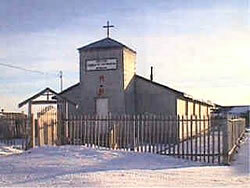 Around 1948, the people of Webequie built a square fence around the community with twelve gates. This was based on the Book of Revelations 21. In Revelations 21, an Angel guides a Prophet to the top of a high mountain. From there, the Prophet saw the city of New Jerusalem descend from the heavens to the earth. It was perfectly square with walls six meters high. The walls were made from jasper, and the the city of gold, adorned with jewels. There were three gates on each side made from pearl, and each gate was guarded by an Angel. The twelve gates represented the twelve tribes of Israel. The gates were open only to the good and pure. The city represented the second coming of Christ. The gates symbolized how those who believed would enter the gate and have eternal life with the Savior. The fence was used to symbolize the purity of Webequie people. The fence built to surround Webequie lasted till the mid seventies. Symbolic fences surround the two graveyards in the community, and the Anglican Church. 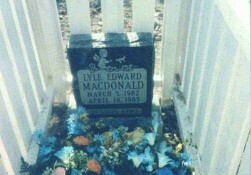 Each grave in the community also has a small fence around the burial plot. This is also symbolic in nature. For many years, the Anglican religion was the only organized religion permitted in the community. Today, a portion of the residents have returned to traditional native spirituality. There are now three sweat-lodges in the community. The renaissance of the traditional ways is a welcomed one. The people are eager to embrace the old ways and revive their culture. The traditional knowledge is being recovered at a considerable rate and the people are once again consulting local medicine men. The teachings are a way of living in harmony with oneself in this modern age. Learn more about the Anglican religion.